This is part 4 in a 5-part series looking at quarterback Jimmy Garoppolo's 2017 season. Part 4 looks at Garoppolo on 3rd down and utilizing play action. Parts 1-3 are hyperlinked at the bottom of the article. In part 1 of this series, we looked at Garoppolo's accuracy across 5 games. In part 2, we looked at his performance under pressure. In part 3, we looked at his performance against the blitz. Today we'll briefly examine his performance on 3rd down and utilizing play action. On 3rd down throws4, Garoppolo was 33-53 for a 62.3% completion percentage, 4 touchdowns, and 2 interceptions. Of those 53 passes, Garoppolo converted on 52.8% of them for 1st downs. For comparison, Brian Hoyer was 35-60 for a 58.3% completion percentage, 2 touchdowns, and 1 interception. C.J. Beathard was 33-58 for a 56.9% completion percentage, 1 touchdown, and 1 interception. Where Garoppolo really stood out, though, was in what football analytics has termed "average depth of target." Average depth of target (aDOT) measures the depth of each throw from the line of scrimmage to where the pass is caught or not to give an accurate representation of the depth each quarterback is throwing to in a given situation. Per Pro Football Focus' Jeff Deeney, Garoppolo's aDOT in 5 games was 9.9 yards. The average need on 3rd down for the 49ers was 7.4 yards. Garoppolo was throwing an average of 2.5 yards past the sticks on 3rd down, further than both Hoyer and Beathard. Beathard had an aDOT throw of 10.2 yards on 3rd down, but the average need on 3rd down while Beathard was quarterback was 8.8 yards, giving Beathard a net 1.4 yards past the sticks. Hoyer's aDOT was 8.2 yards with an average need on 3rd of 7.7 yards, for a .5 yard past the sticks average. Per Football Outsiders "Air Less Expected" (ALEX) stat (aptly named after Alex Smith), Garoppolo had the 3rd lowest percentage of throws short of the sticks at 24.5%, while Hoyer threw short 52.4% of the time (ranked 34th), and Beathard threw short of the sticks 53.4% of the time (ranked 35th). 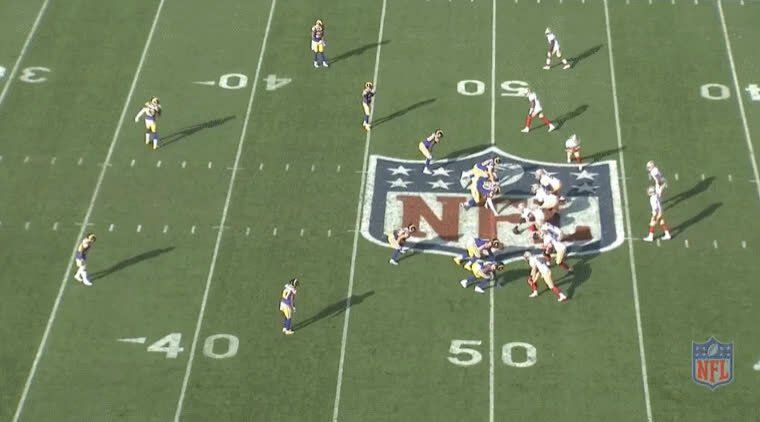 Let's take a look at the film and see what separated Garoppolo from the other quarterbacks on the roster. Against the Bears, Garoppolo immediately showed he could make some clutch throws and on a crucial 3rd and 9 late in the game on the winning drive, he gave us a glimpse of his elite precision and timing in such situations. The 49ers line up in 20 personnel (2 running backs, 0 tight ends, 3 receivers) and are running a flat-7 combo to the right with a double dig to the left of the formation and this is an adaptation straight out of the Patriots' playbook, something Shanahan did with regularity to ease Garoppolo into the playbook. The Bears line up in a cover 6 shell (quarter-quarter-half) where half the field is a cover 2 zone and the other half is man to man on anything vertical or in past 8 yards with the half field safety matching vertical on his side or buzzing the middle of the field on shallower routes. Garoppolo likes what he sees pre-snap as he knows the flat-7 combo routes will clear out the middle of the defense for the double dig. As he did so often during his 5 games, he hit Trent Taylor in stride for a 33-yard gain on 3rd down to set up the winning field goal. Garoppolo throws the ball before makes his in break on the dig, and the ball arrives and hits Taylor in stride, showing that Garoppolo is a good anticipation thrower complimenting his quick release. Against the Titans, the 3rd down successes of the 49ers continued, even in the face of one of the league's highest blitzing defenses, as I covered in my last article. On this play, the 49ers line up in 20 personnel (2 running backs, 0 tight ends, 3 receivers) running a slant/flat combo to the left and a curl/flat combo to the right on 3rd-and-4 in the first quarter. The Titans used a variety of zone blitzes to try and throw the timing of the passing game off, but it didn't work too well. The rest of the Titans defense that doesn't blitz is either locked man to man with the receivers or dropping into hook/seam or curl/flat zones underneath. At the snap, Garoppolo notices the Titans took away his first read to wide receiver Trent Taylor. Garoppolo resets and moves to his right, but there is no one coming open before he feels the pass rush, and he moves back to his left to escape the pocket. Taylor sees the scramble and bails toward the sideline as Garoppolo escapes the rush. As soon as the rushers appear in his face, Garoppolo tosses a nice throw to Taylor on the sideline. Displaying a quick release and timing against the blitz on 3rd down was also another strength. Late in the 2nd quarter facing a 3rd and 4 from the Titans' 40-yard line on an eventual scoring drive, Garoppolo again targets Taylor in the slot. The 49ers are in a personnel grouping favorite of Shanahan, 21 personnel (2 running backs, 1 tight end, 2 receivers) and are running a vertical-out route combination to the 2 receiver side of Hyde and Taylor. The Titans run a "crossfire blitz" which is a double A gap pressure with the blitzing linebackers crossing one after the other. The defensive end, lined up in the 2-point stance in the wide 9-technique, is dropping out into the seam with the innermost receiver. The rest of the secondary plays man coverage with a deep free safety. As the linebackers blitz the A-gaps, center Daniel Kilgore is able to get a chip on a quick double-team block before getting into the 2nd linebacker's blitz and hitting him just enough to allow Garoppolo to rifle a pass out to Taylor in the flat. Taylor gets good separation and Garoppolo hits him in stride with perfect timing, allowing Taylor to turn up field and turn a 4-yard route into a 17-yard catch and run setting the 49ers up just outside the red zone. One underrated aspect of Garoppolo's skill set is his athleticism and ability to move around the pocket and buy time to for plays to develop and players to get open. And he can be deadly accurate too. In the same game on a 3rd-and-5 in the 2nd quarter, the 49ers have dialed up just one of many plays that Garoppolo is familiar with, the Patriots double-slant concept, commonly known as the "pick play." The double slants incorporate a flat route to pull the defenders into each other and free at least one receiver open. The backside of the formation is running a curl/flat combo. 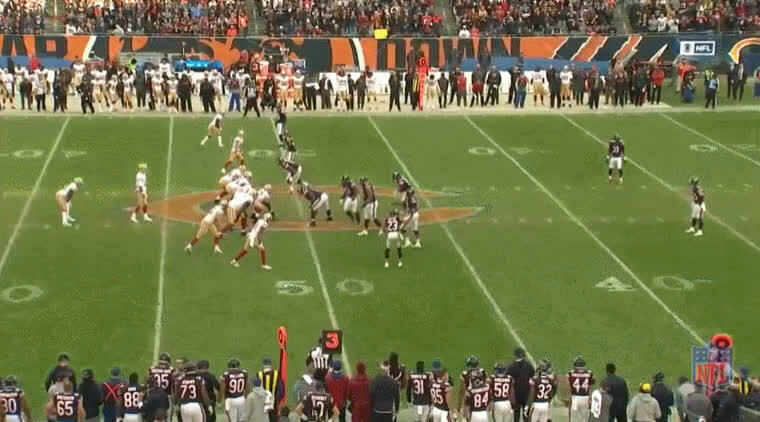 On this play, the 49ers line up in 11 personnel (one running back, one tight end, three receivers). This is a common play featured by the Patriots on anywhere from 3rd-and-2 to 3rd-and-6, though it's usually run out of an empty set. The Titans are playing man to man on the outside and an interior zone inside. At the snap, Garoppolo looks for that inside slant by Taylor, but it's immediately taken away by the outside linebacker dropping into the middle-hook zone. 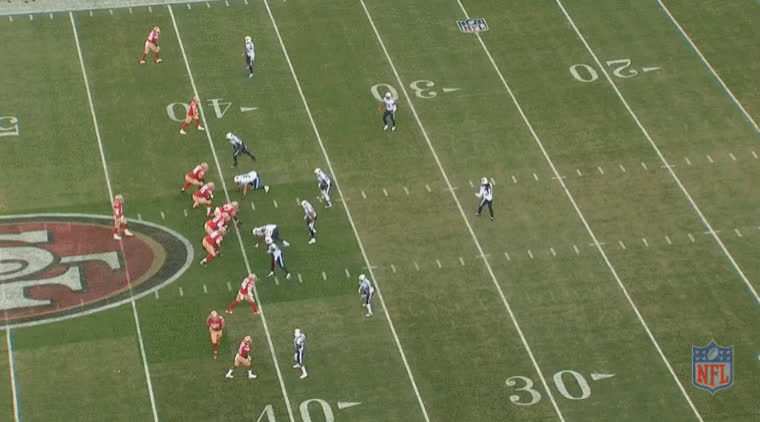 Tight end Celek is wide open at this point, but Garoppolo comes back to the curl/flat combo for a brief moment. When he notices the curl/flat isn't open, he looks to extend the play by escaping the pocket to his right. He finds Celek all alone on the side of the end zone and drills a pass into his chest for a touchdown. Garoppolo's athleticism and precision were also fully on display in week 16 against the top-rated Jaguars pass defense. 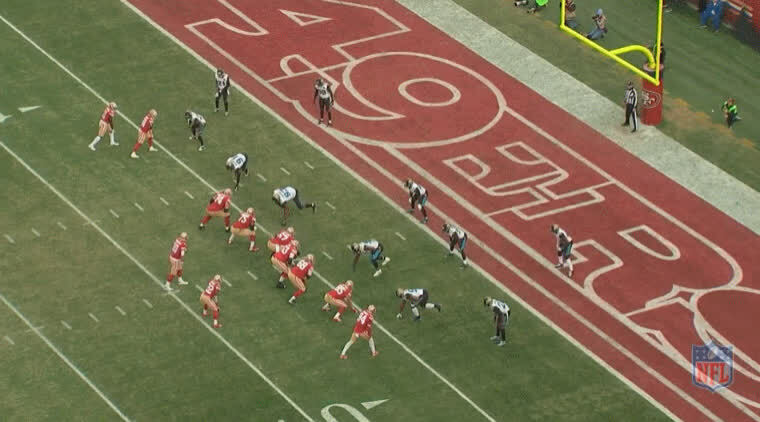 In 11 personnel (1 running back, 1 tight end, 3 receivers) on 3rd and 5 from the Jaguars' 5-yard line, the 49ers run a "smash pivot" concept to the left against the Jaguars zone defense. The Jaguars show a Red 2 defense. Once the ball moves into the red zone, the basic Tampa 2 defense turns into Red 2 defense with the safeties and corners adjusting their technique to account for the short field and reduced throwing lanes. At the snap, the routes are well-covered by the Jaguars zone defense. Garoppolo escapes the pocket and immediately has pressure in his face. Just before he gets hit, he changes the angle of his arm for the throw, and the quick release enables him to get the pass off to Taylor on the scramble drill. Against the Rams, Garoppolo's timing, precision, and accuracy were all on display as he carved up a young Rams replacement defense. It's worth noting that even though the Rams still played a majority of their 2nd team defense on this day, it should not take away from the fact that Garoppolo still had to make throws against the blitz and pressure, and throw into tight-windowed coverage. 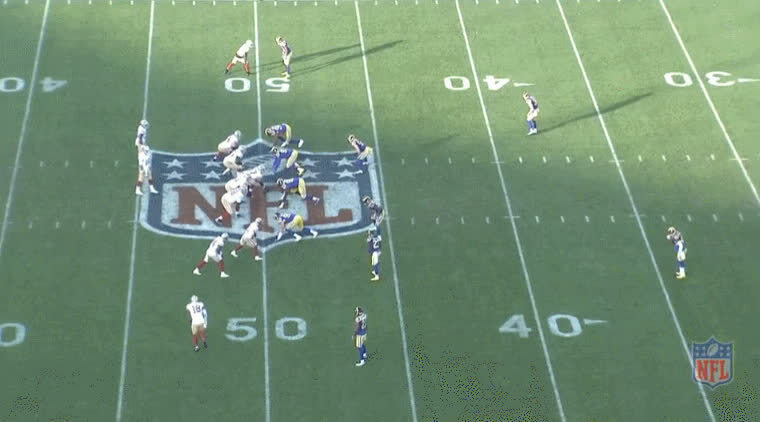 With a 2x2 formation out of 11 personnel, the 49ers are running a spacing concept to the left. The "spacing" concept utilizes either slant routes or "spot/curl routes" to horizontally stretch the defense. In this case, Shanahan draws up a version of spacing where the receivers angle slightly out before making their in cuts. The play perfectly takes advantage of a Rams defense who sends an overload blitz to the field side of the formation. The right defensive end drops out into a curl/flat while the 2-deep safety shell converts to a cover 3. Garoppolo sees the defensive end drop into a zone and sees the middle blitz and immediately knows that he has a small window. 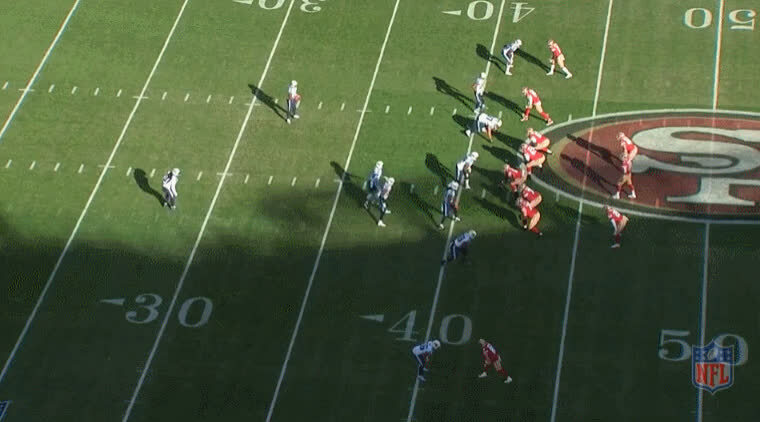 He makes a nice anticipation throw before Taylor even clears the zone defender. Also from the Rams game, out a 3x1 bunch stack to the left, the 49ers dial a classic West Coast Offense staple, the drive concept. Drive is a 3 levels passing concept originally designed by Bill Walsh to get Jerry Rice open underneath against slower coverage defenders. Taylor is running the shallow cross from the middle #2 spot, Louis Murphy (#18) runs the deep dig or curl route after motioning into the #3 spot, and Kendrick Bourne (#84) runs the deep post from the #1 spot. 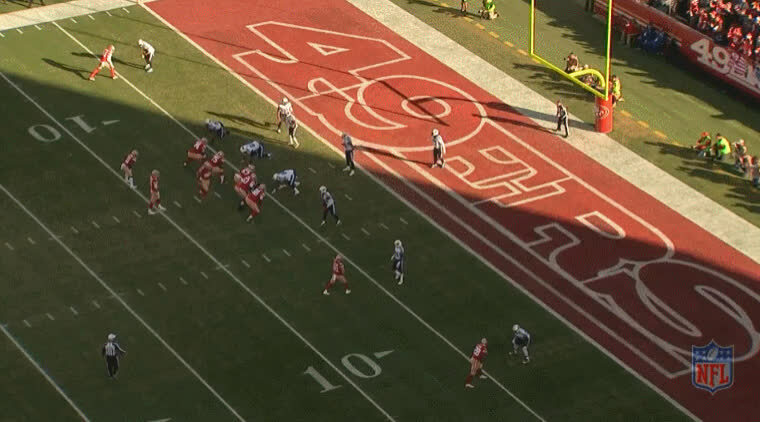 The motion confirms to Garoppolo that the Rams are in a cover 2 with man coverage underneath. At the snap, the Rams interior man coverage immediately takes away the inside routes, essentially leaving Bourne 1 on 1 with the defender who has outside leverage. The corner is at a disadvantage as the underneath routes have cleared out the middle and Bourne breaks inside on the post before the defender can catch him. Garoppolo puts the throw on Bourne immediately for a 3rd down conversion and gain of 16. In the final article of this series, we'll examine what Garoppolo has to work on in order to take his game to the next level.